​Chart Maker - Free online tool for making your own charts. Includes lace, colorwork, and cabling. It even allows for custom stitches. Once you've told the program what you want to do, you can preview the chart and then get a printer-friendly version. Knit Purl Hunter - Check out this website for great knitting video lessons. The topics range from basic techniques (continental style knitting, ktbls, ptbls, wrap and turns), bind-off and cast-on techniques in a variety of contexts, cables, color work, increases, decreases, decorative stitches, finishing, fixing mistakes and videos related to the various knit-alongs sponsored on the site. 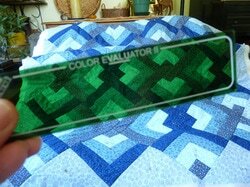 Color Evaluator -- These come in a variety of forms from film to stiff plastic to eye glasses and are designed to help you see the relative lightness or darkness of colors you are considering for a knitting or crocheting pattern. For some things you may want high contrast -- think black and white. For others, you may want something subtle -- think taupey gray and light blue. It's easy to see two colors -- think bright red and bright green -- and not realize that they have an equal value. When worked side-by-side, the pattern may end up blah or murky because there isn't enough contrast. These can be purchased on Amazon.com and are usually $10 or less, depending on the style you select. Clear Kaleidoscope -- This is a type of kaleidoscope that has a clear glass marble at its end. It makes patterns out of what is in the environment instead of from a container of beads, sequins, stones, paper, etc. You can look through the viewing end, point it at a collection of yarn in different colors and see a pattern. You can shift to include more of one color of yarn than another to get a sense of how colors you might select would work in a pattern. They are available on Amazon.com in a range of prizes depending on how fancy a kaleidoscope you want. Row Counter -- Most row counters require you to drop your needles to twist the barrel of the counter or punch the counter. Even smart phone apps like Knit Counter require a pause to tap the screen.This finger-mounted counter just requires the press of a thumb at the end of each row. They are made by a variety of different companies -- Susan Bates, Cosmos® and others -- and come in a variety of colors. Prices on Amazon.com range from $9.53 for the Susan Bates counter to as little as 82-cents for the Cosmos counters, which are sold in a pack of eight for $6.57. On the down side, they aren’t the greatest fit for small hands. The band attaches by inserting plastic nubs into holes on the opposite half of the band. They may eventually stretch. But at 82-cents, does it really matter? Yarn buddy -- Yarn bowls are beautiful, but breakable. A yarn buddy can be tossed in a project bag ready for use wherever you decide to work. A yarn buddy is a spike on a lazy Susan on a weighted base. 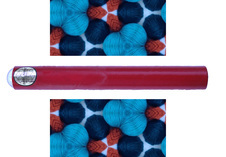 Any yarn cake wound with a ball winder that can be stabbed on the spike can be used. The ball spins in place, unwinding as you work. The yarn stays clean and out of the way of pets. Depending on its materials, a yarn buddy costs about what a yarn bowl does. A plastic “yarn valet” was available on Etsy for $13; a lovely cherry wood version was $35, and double-spindle buddies are available online for $50 or more. No tool is perfect, and neither is this one. It won’t work with spherical balls that don’t have an open core in the center. Ravelry - The go-to place for all things knitting and crocheting. Show off your projects, find out about sales, join a social group, look up patterns by any criteria you can think of, and keep track of your stash.